Nominations for the San Diego Youth Leadership Conference, June 25-28, 2018 to be held on the campus of UCSD are now being accepted. Sophomores, juniors and senior high school students are eligible to apply. As Commander of the San Diego Chapter of The Military Order of the World Wars, I invite your nominations for our annual San Diego Youth Leadership Conference (SDYLC) that we co-sponsor for our youth. Here is a brief description of The Military Order of the World Wars (MOWW). We began in 1919, and our Chapter was established in 1926. Our National website can be easily reached by entering www.moww.org. MOWW is a non-political organization and maintains no lobby in Washington DC. Briefly, MOWW supports our youth, community, military services, and country. We exist to serve others. As a non-profit, we support programs for Boy Scouts, Girl Scouts, JROTC, Youth Leadership Conferences, Massing of the Colors, and more. We also honor our first responders, and each military service throughout the year in different ways. 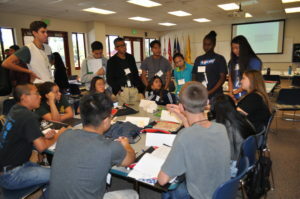 The Youth Leadership Conference is designed for young leaders and potential leaders who are entering their sophomore year through entering their senior year. Each has been selected through a competitive process. The four-day Conference is entirely free for each student. The day begins on Monday with immediate leadership instruction and practice. All students are placed into competitive groups to help develop teamwork and have fun! They spend virtually all day and most of the evenings in leadership activities, seminars, and workshops. They learn and participate in Patriotic Education, Leadership, and American Free Enterprise activities. Please visit the website at www.SDYLC.org for more details and application. Our San Diego Chapter is sponsoring 10 students. Please have your student complete the application, available at www.SDYLC.org and send your rational as to why this student should be selected to Debbie Kash. She is one of four YLC Board members and on-site adult leaders all week long. She is also our chapter’s chair for selecting students for sponsorships. The deadline for accepting nominations and applications is May 1, 2018. Those students who are accepted will be individually notified. Call her with any questions at 760-579-8720 or email debbie.kash@gmail.com. Mail each completed application and nomination letter to Debbie Kash c/o Joseph H. Pendleton YLC, INC., P.O. Box 171, San Marcos, CA 92079. Thank you for accepting this invitation to honor your well-deserving youth.